Most skaters like to buy and skate the Pro-Model skateboard of their favorite skater, which is fine, and you should absolutely do that. It supports the skater and allows them to continue getting free stuff and/or paid to do what they love. It's not often that skaters think about the artist creating the graphics that appear on the decks they buy, unless they particularly like a design, in which case they might give it some attention. As much as I've enjoyed skating pro-models of my favorite skaters, I also know that skating a deck with a design that I really like motivates me even more to skate often and progress. You just feel good skating a good looking deck with a great board graphic. 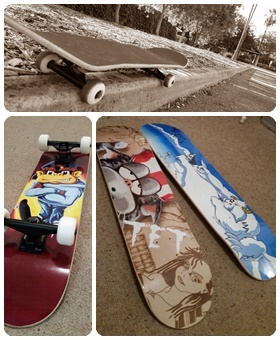 BoardPusher.com is a skate company that supports skater creativity, especially artistic creativity. They make it possible for you to design your own deck graphic and purchase it on a pro-quality deck, or you can search the designs of thousands of artists and buy an amazing deck graphic closer to your interests. If you really enjoy designing skateboard deck graphics, you can even open an online shop with them, and sell your designs to the world. Which is what I have done. 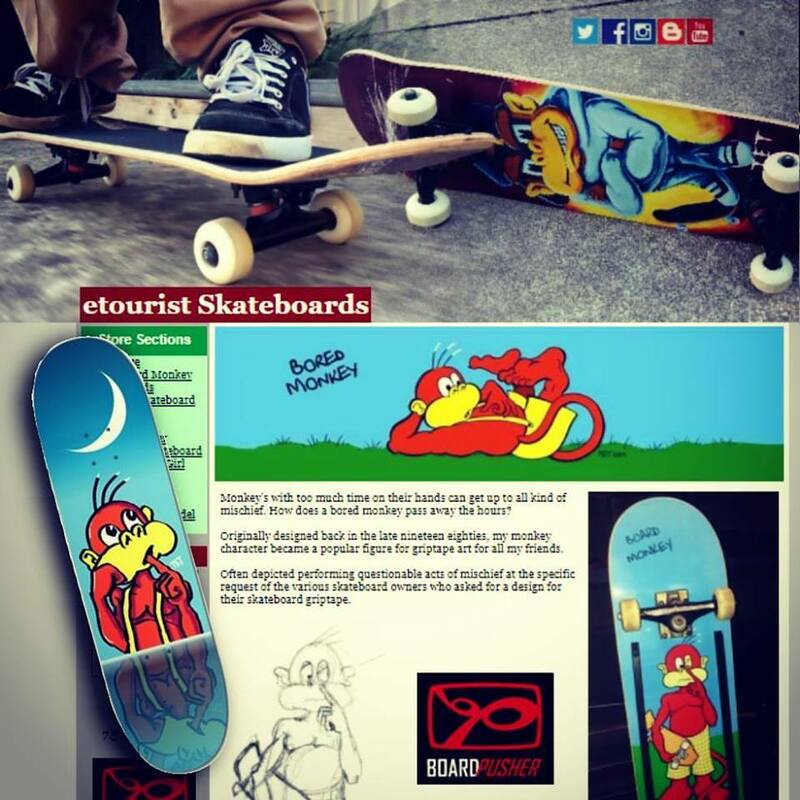 etourist Skateboards is my online skateboard store where you can buy decks featuring my own special brand of art. Each design is available on five different shapes including; 8" Popsicle, Punk Nose Pool, Mini Cruiser, Retro, and Longboard. I've been skating BoardPusher decks for quite some time and can vouch for the quality of both the decks and the graphics printed on them. A newly printed deck from BoardPusher looks simply amazing. You'll want to set it up and see how it skates as soon as you get it. Visit etourist Skateboards and check out my designs (and watch my Skateboard video playlist where you can see some of the designs being created as well as me skateboarding). I'd love it if you purchased one of my decks that you really like but, if you don't find something, why not search BoardPusher's marketplace and support the work of another talented skateboard artist. Then again, you may just launch their designer and create your very own deck. Whatever you do, the deck you buy will be a deck that you'll want to skate because it'll feature art that you really love. You'll skate better and learn faster because your mind will be in a good place about the board you're riding. Supporting your favorite pro skater is a good thing, but if you plan on buying a second deck, or want to try a different shape, like a longboard, or mini cruiser, how about supporting a skateboard artist like myself or one of the many who sell their designs through BoardPusher. * This post is not sponsored by BoardPusher or endorsed by them in any way. It's purpose is to raise awareness of my own BoardPusher online skateboard store. Alvin Owl Longboard Complete - What's in the Box?